The Oculus Rift was one of our favorite things about last year's E3, so we were even more excited to see it at E3 2014. 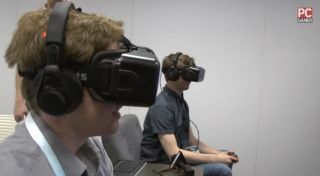 While both Evan and Wes got to try the new Rift DK2 unit and a trio of demos, they also spoke with Oculus vice president Nate Mitchell about the company's big hires—such as Naughty Dog co-founder Jason Rubin —and big plans for first-party content. Be sure to check out the rest of our E3 2014 coverage all this week.